The Trump administration recently announced that it would cut funding by 40% — from $63 million to $37 million — for organizations that provide in-person assistance to Americans looking to sign up for coverage, known as the navigator program. The community-based organizations that sign on to be navigators focus on underserved areas or more vulnerable populations. Some of these organizations may have no choice but to cease outreach around Open Enrollment altogether and others will be forced to lay off staff and scale back their efforts to help people enroll. The result will be that fewer people will have access to the type of assistance they need to get health insurance. As a reminder, these cuts are on top of other decisions by the administration to cut in half the time people have to sign up for health insurance from 90 days to only 45, to slash funding for advertising and outreach by 90 percent and to schedule 3 days of maintenance for HealthCare.gov where the site will not work. After announcing the cuts to the navigator program, the administration waited two weeks until late on September 13 — despite the fact that Open Enrollment was just around the corner (it starts on November 1) — before telling navigators how much they would be awarded. While the administration claims they used a new formula to match navigator funding to their enrollment goal for the previous year, it’s not clear that is the case with some groups who met their goals still receiving major funding cuts. What is known is that all of the hard work navigators do each day — beyond just signing people up for plans in the ACA marketplaces — was not taken into account. Already, the Ohio Association of Food Banks, who focused on reaching people in rural areas across Ohio, has announced that they will no longer be able to continue their navigator program. Their budget was cut by 71 percent from nearly $1.7 million to about $486,000. There is only one navigator remaining in Ohio, and their budget is just $82,000. This means that out of the 88 counties in Ohio, only 15 will have navigators who service their area — and there will be zero navigators serving the two most populous counties of Franklin (Columbus) and Cuyahoga (Cleveland) Counties. The administration initially released the preliminary awards before informing recipients that the information was private and should not be shared; however, you can view the list in its entirety here and see additional breakdowns of the data. Some states fared a lot worse than others. In fact, 15 states had their overall navigator funding reduced by at least 56 percent. Another way to analyze how states were impacted, is to look at how the states who were the biggest drivers of enrollment were impacted by these cuts. Last year, the below 10 states were responsible for 66% of 2017 sign-ups, yet these states had their overall budgets cut by 39%. The states that fared the worst — Georgia had their budget cut by 61%; Michigan had its budget cut by 72%; and New Jersey had its budget cut by 62%. While the cuts to the navigator program overall were severe, some industries and specific types of organizations faced especially large cuts. Tribal Organizations: Seven navigators listed helping the Native American community enroll as key to their enrollment efforts. Overall, the budgets for these 7 organizations were cut by 58 percent — from a total of $1.6 million to $650,000. Two of these organizations were cut completely, and two others had their budgets cut by 93% or more. Hospitals: Hospitals and health clinics have always played an important role in helping people sign up for coverage. 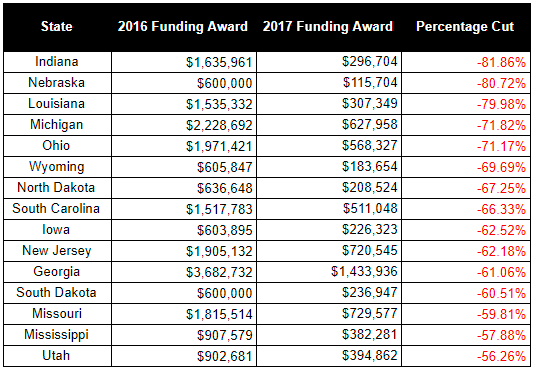 In 2017, 16 hospitals or clinics were awarded $9.4 million in grants. For 2018, the Trump administration cut this funding by 55% to a total of $4.3 million. A Georgia navigator who received $2.3 million in 2017 had their grant reduced to $328,000 — an 86% cut. And a health clinic in Illinois had their budget cut by 94% — from $180,000 to $10,000.